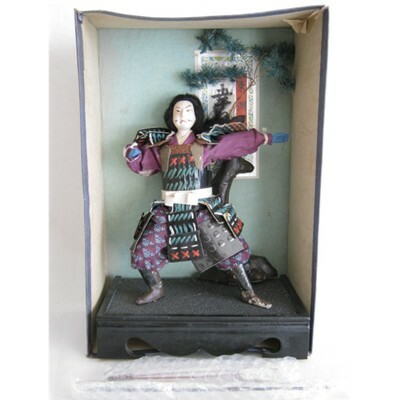 NAME: Vintage Japanese costume doll of Yoshitsune, original cardboard box, no lid. AGE: Mid Showa (1926-1989), probably late 40's to 50's. 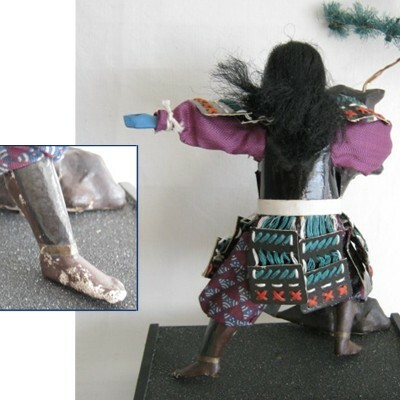 CONDITION: Some light dirt and wear to the paint on the feet and a spot on his armor. His right sleeve has become undone and needs to be glued. The material under the arms was a little short and you can see the straw body underneath. Cardboard box shows it's age, has a split corner and the lid is missing. He does not have pegs in the feet and I'm not sure how he is supposed to stand. There is a small hole in the stand. Maybe he holds onto the bow and the other end goes in the hole? NOTES: The hands are carved wood. 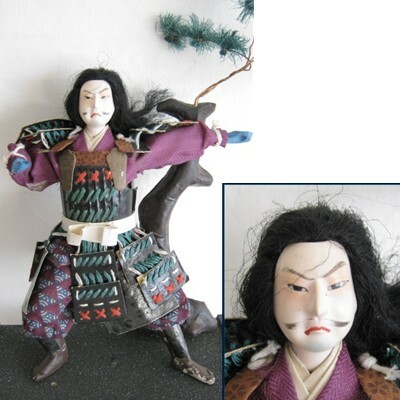 His accessories include a sword, bow and a couple of arrows.